I started making the Featherweight Cardigan by Hannah Fettig. I wanted to show a photo of the finished garment, but they have the photos protected. I probably should not have paid the money to purchase this pattern, as I could have easily written it up myself. Perhaps that is why the photos are so closely guarded. The concept is good, using a lace weight yarn to make a very light and airy sweater. As usual, I wish that I would have thought through the pattern more. The front edges should have been slipped at the beginning of every row to make the pick-up for the collar go easier. I am thinking that the back is getting wide, and the stitches between the sleeves on the cast-on should have been less. For now, I am just continuing to knit, I don’t feel like ripping back, and want to see how the pattern turns out. The sweater is knit with Malabrigo Azul lace weight yarn, a beautiful blend of blue with teal and green accents, on size 6 needles. 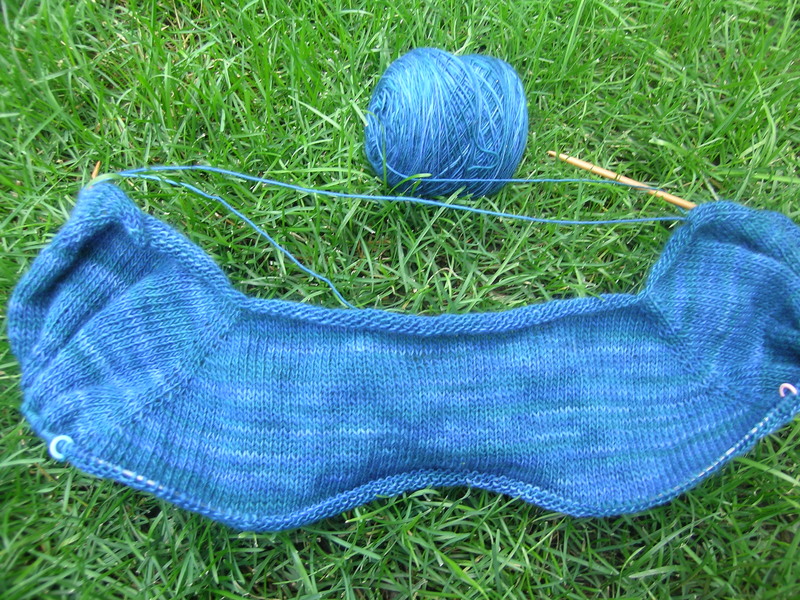 While easy, it is still a lot of knitting, as you use over 1,000 yards of yarn. This is my mindless knitting for the next 2 weeks. I am contemplating a more complicated shawl also. I look at my unfinished sweaters and just can’t stand the thought of holding them on my lap in 90 degree heat.